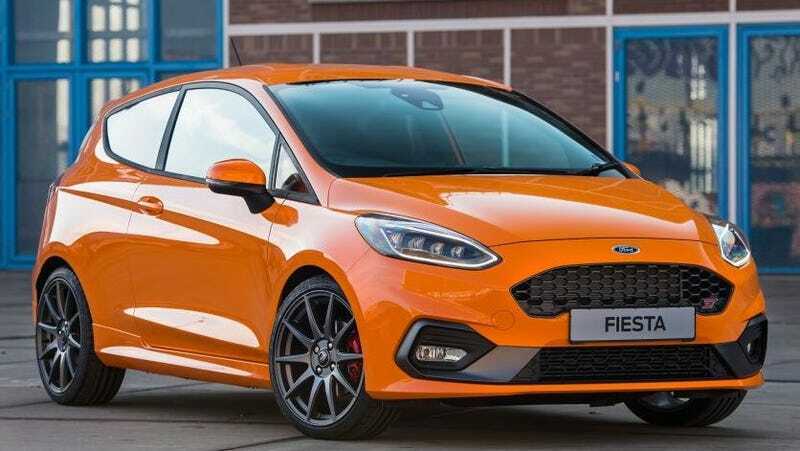 The new Fiesta ST Performance Edition is based on the two-door Fiesta ST-3 hatchback trim, which is the top-spec version with all of the upgrades like a back-up camera, parking sensors, red brake calipers, heated mirrors and steering wheel, etc. In the UK, it starts at £22,145, or roughly $28,950 at current exchange rates. The Performance Edition piles even more on top of that, though, according to the specifications reported by Evo Magazine. It gets upgraded speakers, LED headlights, a performance shift light inside, a launch control setting, bespoke 18-inch lightweight 10-spoke grey wheels, a new adjustable coilover suspension setup with a lowered ride height and blue springs, and a limited-slip differential, according to a press release sent to Jalopnik by Ford of Britain. It keeps the 1.5-liter three-cylinder engine making 197 horsepower and 214 lb-ft of torque. It’s finished off with a new Deep Orange color—orange is an underrated color for cars, shamefully ruined by Lamborghinis but perfect for the little Fiesta ST—and will be limited to just 600 models exclusive to the UK. It’s expected to be priced around £3,000 more than the ST-3 trim, according to Evo Magazine, or roughly around $33,000. As someone who genuinely thinks the American 335 horsepower Edge ST crossover will probably be a lot of fun to drive, I’d take an orange Fiesta ST two-door hatch over it any day of the week. And for the record, trying to smuggle one into the U.S. would violate multiple federal regulations, and the car would be seized and likely crushed. So much for freedom!